THE WRITING BUDDHA - Opinions | Books | Movies: Making India Awesome by Chetan Bhagat (Book Review- 3.5*/5) !!! 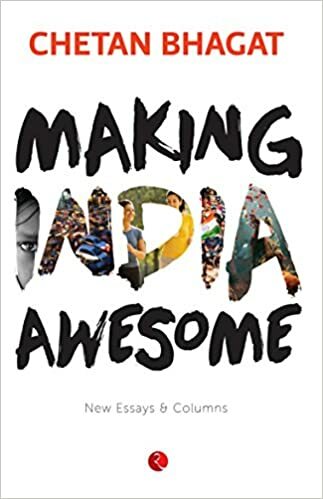 Making India Awesome by Chetan Bhagat (Book Review- 3.5*/5) !!! Let 1000 better writers than Chetan Bhagat get released and published in India but whenever the book by the Superstar himself releases, the pre-booking breaks all the records. I can never resist buying his book as soon as the pre-order is opened for all the readers. Chetan Bhagat's 8th book overall and categorically, 2nd non-fictional book released 2 days back named "Making India Awesome". Chetan Bhagat never does a big launch and marketing tactics for his non-fictional books. He somewhere believes that people concerned with the growth of nation and having love for the country will definitely purchase a book based upon the idea of how to make it the Superpower. But without any fanfare too, the fans like me get to know about his book release. "Making India Awesome" is Chetan Bhagat's attempt of sharing essays and columns he have written on nation time to time and explaining the complex issues in the easiest language possible. It is definitely in the lines of his first non-fictional book, "What Young India Wants?" but here, he is not that biased towards parties the way he was in the former. Still, his love for Narendra Modi and BJP was evident in few sentences. The intention of the book can be clearly understood right from the first chapter itself. Chetan wants the nation to improve and therefore, he discusses ideas on many issues about how they can be resolved with whatever more or less knowledge he had regarding the same. He have divided the book in four different parts- Awesome Governance, Awesome Equality, Awesome Society and Awesome Resources. Accordingly, he have discussed points like politics, economy, societal values, women's right, gay rights, minority rights and the transformation youth can bring to the nation. This 176-pages book is a light-read and you will find an urge of having an opinion on all the issues after you will end up reading the book. You will want to have an angle in your life for the nation too rather than only blaming the government, ministers and the whole system. But there's a big problem with the ideas and solutions Chetan Bhagat have provided. The most of them are meant for the government and Prime Minister. The book is mainly like an open letter to Narendra Modi than to the youths of India. The book has been projected as if it's written for us on how to bring glory to the nation at personal level but it's more about how government can improve various things. He have discussed points on how even we can bring the change but even those points aren't much effective except few which are literally possible. I wish if Chetan Bhagat could have been little more sensible in putting up the solutions as some of them are really very silly to even think. I would give this pure effort 3.5* out of 5. Go For It!